Even More Updates to ITOPL!!! The genus of the subject of the proposition: "Socrates is an animal." The species of the subject: "Socrates is a man"
The subject's specific difference: "Socrates is rational." An essential trait or property (proprium) of the subject: "Socrates is risible (i.e., able to laugh)." An unessential trait or accident of the subject: "Socrates is white." B. Genus & Species. A genus (plural, "genera") is a class of things that differ in kind--e.g., "animal" is a genus, because it is a class of things (e.g., cats, dogs, cows, etc.) that differ in species. A species is a class of things that differ in number (i.e., many individuals) but not in kind--e.g., "man" is a species, because it is a class of numerous individuals of the same kind. A genus is thus divided into different species and a species is divided into different individuals. Now, the term "species" can be extended to include narrower genera that fall under broader genera. Therefore, the narrower genera relate to the broader genera as species to a genus and, thus, may be called "species" with respect to their broader genus--e.g., "animal" and "plant," though they are genera (with respect to different species of animal and plant), may themselves be called "species" of "living thing"; "living thing," though a genus with respect to "animal" and "plant," is a species of "body" (i.e., physical substance). In the end, there will be ultimate genera (summum genus or genus generalissimum) which are not species of any broader genera; there will also be ultimate species (infima species or species specialissima) that are have no species under them, but only individuals. C. Predication. Whatever is true of the genus is true of the species (but not vice versa), and whatever is true of the species is true of the subject or individual (but not vice versa); therefore, whatever is true of the genus is true of the individual. When one thing is predicated of another [in a proposition consisting of a subject and a predicate], all that which is predicable of the predicate will be predicable also of the subject. Thus, 'man' is predicated of the individual man [e.g., "this individual is a man"]; but 'animal' is predicated of 'man' [e.g., "man is an animal"]. Therefore, it [i.e., animal] will be predicable of the individual man also [e.g., "this individual in an animal"]: for the individual man is both 'man' and 'animal'. [The Five Predicables.] [O]f predicates [within propositions], some are (A) predicable of one thing alone, as individuals, for instance, "Socrates," and "this man," and "this thing;" but others are (B) predicable of many, as are (1) genera, (2) species, (3) differences, (4) properties, and (5) accidents, predicated in common, but not peculiarly to any one thing. Now (1) genus is such as "animal," (2) species as "man," (3) difference as "rational," (4) property as " risible," (5) accident as "white," "black," "to sit." [The First Two Predicables: Genera & Species] [G]enus is that which is predicated of many things differing in species, in answer to [questions concerning] what a thing is, e. g. "animal." [...] That is called species also, which is under the genus stated, according to which we are accustomed to call "man" a species of "animal," "animal" being genus, but "white" a species of "colour," and "triangle" of "figure." Nevertheless, since when we define the genus, we make mention of species, saying "that which is predicated of many things differing in species in reply to [questions concerning] what a thing is," and call species "that which is under the assigned genus," we ought to notice that, since genus is the genus of something, and species the species of something, each of each, we must necessarily use both in the definitions of both. [Subaltern Genera & Species.] They, therefore, define species thus: (1) "species is what is arranged under genus, and of which genus is predicated in reply to [questions concerning] what a thing is." [They] also [define it] thus, (2) "species is what is predicated of many things differing in number in reply to [questions concerning] what a thing is." This [second] definition [of species], however, belongs to the most specific [species] (species specialissima), and which is species only, but no longer genus also, but the other [definition] will pertain to such as are not the most specific [species] (species specialissima). Now, what we have stated will be evident in this way: in each category there are certain things most generic, and again, others most special, and between the most generic and the most special, others which are alike called both genera and species, but the most generic is that above which there cannot be another superior genus, and the most special that below which there cannot be another inferior species. Between the most generic and the most special, there are others which are alike both genera and species, referred, nevertheless, to different things. [This] may become clear [by way of example] in one category. "Substance" indeed, is itself a genus; under this is "body" [i.e., physical substance], under "body" is "living body," under which is "animal"; under "animal" is "rational animal," under which is "man,"* under "man" is Socrates, Plato, and particular men. Still, of these, "substance" is the most generic [genus] (summum genus), and that which is genus only; but "man" is most specific [species] (species specialissima), and that which is species only; yet "body" is a species of "substance," but a genus of "living" body, also "living body" is a species of "body," but a genus of "animal"; again, "animal" is a species of "living body," but a genus of "rational animal," and "rational animal" is a species of "animal," but a genus of "man," and "man" is a species of "rational animal,"* but is not the genus of particular men, but is only the species [to which they belong], and every thing prior to individuals being proximately predicated of them, will be species only, and no longer genus also. As then, "substance" being in the highest place, is most generic [genus] (summum genus), from there being no genus prior to it, so also "man"--being a species after which there is no other species, nor any thing capable of division into species, but individuals (for Socrates, Plato, Alcibiades, and this white thing, I call individual)--will be species alone, and the last species, and as we say the most specific [species] (species specialissima). Yet the media [i.e., the intermediate genera/species] will be the species of such as are before them, but the genera of things after them, so that these have two conditions, one as to things prior to them, according to which they are said to be their species, the other to things after them, according to which they are said to be their genera. The extremes [i.e., the summum genus and the species specialissima], on the other hand, have one condition, for the most generic [genus] (summum genus) has indeed a condition as to the things under it, since it is the highest genus of all, but has no longer one as to those before it, being supreme, and the first principle, and, as we have said, that above which there cannot be another higher genus. Also, the most specific has one condition, as to the things prior to it, of which it is the species, yet it has not a different one, as to things posterior to it, but is called the species of individuals, so termed as comprehending them, and again, the species of things prior to it [i.e., its genera], as comprehended by them, wherefore the most generic genus (summum genus) is thus defined to be "that which being genus is not species," and again, "that above which there cannot be another higher genus"; but the most specific species (species specialissima), as "that which being species is not genus", and "that which being species we can no longer divide into species"; and also "that which is predicated of many things differing in number, in reply to [questions concerning] what a thing is." [Predication: Genus, Species, and Individual.] Genus then, and species, being each explained as to what it is, since also genus is one, but species many, for there is always a division of genus into many species, genus indeed is always predicated of species, and all superior of inferior, but species is neither predicated of its proximate genus, nor of those superior, since it does not reciprocate. For it is necessary that either equals should be predicated of equals, as "neighing" of "a horse," or that the greater should be predicated of the less, as "animal" of "man," but the less no longer of the greater, for you can no longer say that "animal" is "man," as you can say that "man" is "animal." Of those things however whereof species is predicated, that genus of the species will also be necessarily predicated, also that genus of the genus up to the most generic; for if it is true to say that Socrates is "a man," but that "man" is "an animal," and that "animal" is "a substance," it is also true to say that Socrates is "an animal" and "a substance." 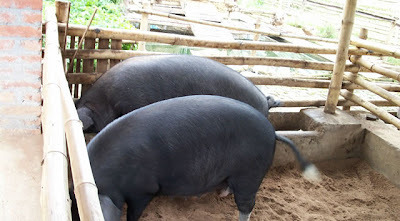 At least, since the superior are always predicated of the inferior, species indeed will always be predicated of the individual, but the genus both of the species and of the individual, and the most generic of the genus (or the genera, if the media and subaltern be many) of the species, and of the individual. For the most generic is predicated of all the genera, species, and individuals under it, but the genus, which is prior to the most specific species, is predicated of all the most specific species and individuals; but what is species alone of all its individuals, but the individual of one particular [thing] alone. Now, an individual is called "Socrates," "this white thing," "this man who approaches," "the son of Sophroniscus" (if Socrates alone is his son), and such things are called individuals, because each consists of properties of which the combination can never be the same in any other, for the properties of Socrates can never be the same in any other particular person; the properties of "man," indeed, (I mean of him as common) may be the same in many, or rather in all particular men, so far as they are men. Wherefore the individual is comprehended in the species, but the species by the genus, for genus is a certain whole, but the individual is a part, and species both a whole and a part; part indeed of something else, but a whole not of another, but in other things, for the whole is in its parts. Concerning genus then, and species, we have shown what is the most generic, and the most specific, also what the same things are genera and species, what also are individuals, and in how many ways genus and species are taken. Things are to be named analogously when, though they have a name in common, the definitions corresponding with the name are partly the same and partly different, with one of those definitions being prior to the others... "For example, 'healthy' as said of urine signifies a sign of the health of the animal, but said of medicine it signifies the cause of the same health" [St. Thomas, Summa Theologiae I.15.5c]. Forms of speech are either simple* [i.e., terms] or composite [i.e., propositions or judgments]. Examples of the latter are such expressions as 'the man runs', 'the man wins'; of the former 'man', 'ox', 'runs', 'wins'. [O]ne should view the parts of logic according to the diversity among the acts of reason. Now there are three acts of the reason, (A) the first two of which belong to reason regarded as an intellect. (1) One action of the intellect is the understanding [i.e., simple apprehension] of indivisible or uncomplex things, and according to this action it conceives what a thing is. And this operation is called by some the informing of the intellect, or representing by means of the intellect. To this operation of the reason is ordained the doctrine which Aristotle hands down in the book of Predicaments, [i.e., Categories]. (2) The second operation of the intellect is its act of combining or dividing [i.e., judgment], in which the true or the false are for the first time present. And this act of reason is the subject of the doctrine which Aristotle hands down in the book entitled On Interpretation [i.e., Peri hermeneias or De interpretatione]. (B) But the third act of the reason is concerned with that which is peculiar to reason, namely, to advance from one thing to another [i.e., discursive reasoning] in such a way that through that which is known a man comes to a knowledge of the unknown. And this act is considered in the remaining books of logic. It should be noted that the acts of reason are in a certain sense not unlike the acts of nature [...]. Now in the acts of nature we observe a threefold diversity [...]. These three are found also in the acts of the reason. For there is (1) one process of reason which induces necessity, where it is not possible to fall short of the truth; and by such a process of reasoning the certainty of science is acquired. Again, there is (2) a process of reason in which something true in most cases is concluded but without producing necessity. But (3) the third process of reason is that in which reason fails to reach a truth because some principle which should have been observed in reasoning was defective. (1) Now the part of logic which is devoted to the first process is called the judicative part, because it leads to judgments possessed of the certitude of science [...]. 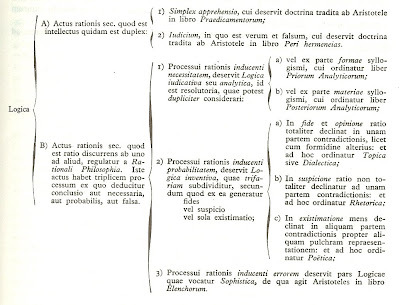 Furthermore, the certitude obtained by such an analysis of a judgment is derived either (a) from the mere form of the syllogism—and to this is ordained the book of the Prior Analytics which treats of the syllogism as such—or (b) from the matter along with the form [...]—and to this is ordained the book of the Posterior Analytics which is concerned with the demonstrative syllogism. (2) To the second process of reason another part of logic called investigative is devoted. For investigation is not always accompanied by certitude [...]. But just as in the works of nature which succeed in the majority of cases certain levels are achieved [...] so too in that process of reason which is not accompanied by complete certitude certain levels are found accordingly as one approaches more or less to complete certitude. For (a) although science is not obtained by this process of reason, nevertheless belief or opinion is sometimes achieved (on account of the provability of the propositions one starts with), because reason leans completely to one side of a contradiction but with fear concerning the other side. The Topics or dialectics is devoted to this. For the dialectical syllogism which Aristotle treats in the book of Topics proceeds from premises which are provable. At times, however, (b) belief or opinion is not altogether achieved, but suspicion is, because reason does not lean to one side of a contradiction unreservedly, although it is inclined more to one side than to the other. To this the Rhetoric is devoted. At other times (c) a mere fancy inclines one to one side of a contradiction because of some representation, much as a man turns in disgust from certain food if it is described to him in terms of something disgusting. And to this is ordained the Poetics. For the poet’s task is to lead us to something virtuous by some excellent description. And all these pertain to the philosophy of the reason, for it belongs to reason to pass from one thing to another. (3) The third process of reasoning is served by that part of logic which is called sophistry, which Aristotle treats in the book On Sophistical Refutations [i.e., Elenchorum]. § 1. Christ the Lord entrusted the deposit of faith to the Church, so that she, with the unfailing assistance of the Holy Spirit, would maintain in a holy way revealed teaching and faithfully expound it. § 2. The Church has the right and duty, independent of any civil power, of teaching all peoples evangelical doctrine: and thus, by divine law, all are bound to embrace the Church of God and rightly to heed her truth. § 1. All of those things are to be believed with a divine and Catholic faith that are contained in the written word of God or in tradition and that the Church proposes as worthy of belief, as divinely revealed, whether by solemn judgment or by her ordinary and universal magisterium. § 2. It belongs to an Ecumenical Council or to the Roman Pontiff speaking ex cathedra to pronounce solemnly this sort of judgment. § 3. A thing is not understood as dogmatically defined or declared unless this is manifestly established. It is not enough to avoid heretical depravity, but also those errors should be diligently fled that more or less apprach [heresy]; therefore, all must observe the constitutions and decrees by which these sorts of depraved opinions are proscribed and prohibited by the Holy See. § 1. The faithful of Christ are bound to profess their faith whenever their silence, evasiveness, or manner of acting encompasses an implied denial of the faith, contempt for religion, injury to God, or scandal for a neighbor. § 2. After the reception of baptism, if anyone, retaining the name Christian, pertinaciously denies or doubts something to be believed from the truth of divine and Catholic faith, [such a one is] a heretic; if he completely turns away from the Christian faith, [such a one is] an apostate; if finally he refuses to be under the Supreme Pontiff or refuses communion with the members of the Church subject to him, he is a schismatic. § 3. Let Catholics beware lest they have debates or conferences, especially public ones, with non-Catholics without having come to the Holy See or, if the case is urgent, to the local Ordinary. Bishops also, although individually and even gathered in particular Councils they do not partake of infallibility in teaching, nevertheless, for those faithful committed to their care under the authority of the Roman Pontiff, they are truly doctors and teachers. §1. The Church, to which Christ the Lord has entrusted the deposit of faith so that with the assistance of the Holy Spirit it might protect the revealed truth reverently, examine it more closely, and proclaim and expound it faithfully, has the duty and innate right, independent of any human power whatsoever, to preach the gospel to all peoples, also using the means of social communication proper to it. §1. All persons are bound to seek the truth in those things which regard God and his Church and by virtue of divine law are bound by the obligation and possess the right of embracing and observing the truth which they have come to know. §1. By virtue of his office, the Supreme Pontiff possesses infallibility in teaching when as the supreme pastor and teacher of all the Christian faithful, who strengthens his brothers and sisters in the faith, he proclaims by definitive act that a doctrine of faith or morals is to be held. §1. 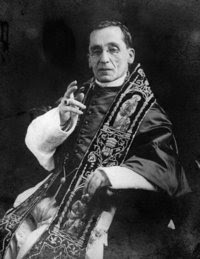 A person must believe with divine and Catholic faith all those things contained in the word of God, written or handed on, that is, in the one deposit of faith entrusted to the Church, and at the same time proposed as divinely revealed either by the solemn magisterium of the Church or by its ordinary and universal magisterium which is manifested by the common adherence of the Christian faithful under the leadership of the sacred magisterium; therefore all are bound to avoid any doctrines whatsoever contrary to them. 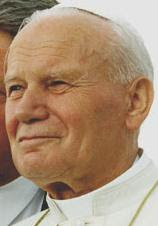 Heresy is the obstinate denial or obstinate doubt after the reception of baptism of some truth which is to be believed by divine and Catholic faith; apostasy is the total repudiation of the Christian faith; schism is the refusal of submission to the Supreme Pontiff or of communion with the members of the Church subject to him. Although not an assent of faith, a religious submission of the intellect and will must be given to a doctrine which the Supreme Pontiff or the college of bishops declares concerning faith or morals when they exercise the authentic magisterium, even if they do not intend to proclaim it by definitive act; therefore, the Christian faithful are to take care to avoid those things which do not agree with it. Although the bishops who are in communion with the head and members of the college, whether individually or joined together in conferences of bishops or in particular councils, do not possess infallibility in teaching, they are authentic teachers and instructors of the faith for the Christian faithful entrusted to their care; the Christian faithful are bound to adhere with religious submission of mind to the authentic magisterium of their bishops. All the Christian faithful are obliged to observe the constitutions and decrees which the legitimate authority of the Church issues in order to propose doctrine and to proscribe erroneous opinions, particularly those which the Roman Pontiff or the college of bishops puts forth. §1. It is above all for the entire college of bishops and the Apostolic See to foster and direct among Catholics the ecumenical movement whose purpose is the restoration among all Christians of the unity which the Church is bound to promote by the will of Christ. Hermanos: Os recuerdo el Evangelio que os prediqué y que vosotros habéis recibido y en el que perseveráis, por el cual alcanzáis la salvación; mirad, si lo conservaís como yo os lo prediqué, porque, si no, en vano lo hubierais abrazado. Yo os enseñé lo que aprendí: que Cristo murió por nuestros pecados, según las Escrituras: que fue sepultado y que resucitó al tercer día, según las mismas Escrituras: después fue visto por Pedro y por los once Apóstoles. Más tarde se manifestó a más de quinientos hermanos juntamente, muchos de los cuales viven aún, y otros han muerto ya. Aparecióse después a Santiago y a los demás Apóstoles; y últimamente a mí, que vengo a ser como un abortivo; porque soy el último de los Apóstoles; y ni aun de este nombre de Apóstol soy mercedor, porque antes perseguí la Iglesia de Dios. Pero por su gracia soy lo que soy, y su gracia no ha sido estéril en mí. En aquel tiempo, saliendo Jesús de los confines de Tiro, vino por Sidón hasta el mar de Galilea, atravesando la Decápolis. Lleváronle un sordomudo y le rogaron que le impusiese las manos. Mas Él, separándole de en medio de la multitud, puso los dedos en sus orejas; y con un poco de saliva, tocó su lengua; y mirando al cielo, arrojó un suspiro y dijo: Effeta, que significa: Abríos. Y al momento se le abrieron los oídos, se le soltó la lengua y empezó a hablar bien. Y les mandó que no dijeran nada a nadie. Pero cuanto más les decía que callasen, más ellos lo publicaban y crecía su admiración diciendo: Ha hecho bien todas las cosas; Él ha hecho oir a los sordos y hablar a los mudos. Es una gran alegría y honor celebrar mi primera misa dominical en México, en la tierra de Nuestra Señora de Guadalupe, en la ciudad de Guadalajara, con Uds, especialmente con los miembros de Una Voce México, que nos han apoyado mucho para poder venir aquí. Me llamo Padre Jonathan Romanoski, pero será más facil que me llamen “Padre Romo,” como me dicen mis amigos. Y por eso quiero reclamar el patronaje de Santo Toribio para mi ministerio sacerdotal aquí en Guadalajara. Fui ordenado recientemente en la fiesta del Sagrado Corazón por el Cardenal Castrillón Hoyos en los EEUU, como miembro de la Fraternidad Sacerdotal San Pedro, una sociedad sacerdotal fundada por Su Santidad Juan Pablo II para conservar y mantener las tradiciones litúrgicas antiguas. Y gracias a la invitación del Cardenal Juan Sandoval Íniguez ahora comenzamos con nuestro primer apostolado en México en la arquidiócesis de Guadalajara. Hasta que venga el superior de este apostolado en septiembre, cuando nos mudaremos a nuestra propria iglesia, vamos a celebrar la misa aquí con el permiso generoso de su reverencia el Padre Trinidad. 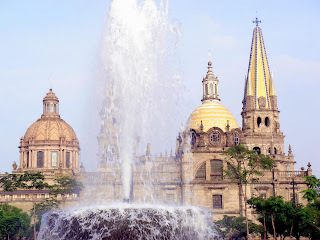 A partir de mi primera visita a Mexico hace unos años, siempre fue mi sueño trabajar algún día en este país, y particularmente en Guadalajara, donde quedé encantado de ver lo que permanece de la Cristiandad--una cultura que, aunque va disminuyendo, es más católica que muchas otras partes del mundo. Dicha cultura católica fue un regalo de la Madre de Dios, la Reina misma del cielo y de la tierra. Así leemos bajo la tilma--Non fecit taliter omni nationi, que quiere decir--No ha hecho así con ninguna otra de las naciones. Y me encanta celebrar el rito de la misa de hoy, en la misma forma de culto que formó esta cultura, el rito que formó la vida espiritual de tantos sacerdotes, como San Felipe de Jesús, el Beato Miguel Pro, Santo Toribio Romo, San Padre Pío, y de hecho, todos los santos del rito romano desde la edad de San Gregorio Magno. A la gente se le enseñan las verdades de la fe, a apreciar los gozos interiores de la religión, mucho más efectivamente a través de la celebración anual de nuestros sagrados misterios que a través de cualquier declaración oficial de las enseñanzas de la Iglesia. Tales declaraciones usualmente llegan a poca gente, y más a los fieles con educación que a cualquier otra persona; las fiestas de la Iglesia llegan a todo el mundo. Las declaraciones hablan sólo una vez; las fiestas hablan cada año—de hecho, por siempre. He aquí la importancia de la sagrada liturgia, donde la ley de la oración establece eficazmente la ley de la creencia. Así nos encontramos, como el surdomudo de hoy, delante de los sagrados misterios de la liturgia divina, en los cuales escuchamos mucho silencio, que llama la atención de ellos que la ven por primera vez, y aveces los pone incómodos. ¿Como entenderlo entonces? Es un silencio que habla, en que sólo Dios habla. Recuerden que San Elías no escuchó la voz de Dios sobre la montaña ni en los truenos ni los rayos, mas en el susurro de un viento suave, cual silencio nos enseña la verdad mas importante que Santa Catalina recibió en todas sus revelaciones, y ella escribió libros enteros en un estado de écstasis. Sobre todo, Jesús le dijo que la suma de todo que le reveló, lo más importante de recordar, era lo siguiente, que “yo soy el que soy, y tú eres lo que no es;” que somos más pasivos delante de Dios que activos; que sólo podemos alabarle, glorificarle, y amarle, en proporción al grado que recibamos su gracia y amor. Así esperaron los paganos de esta tierra sin la gracia de Dios, hasta que Jesucristo, el Dios hecho carne, les puso su dedo divino en sus oidos, y por un milagro palpable de la Virgen de Guadalupe, dijo “abríos,” y luego las aguas bautismales corrieron sobre la tierra seca, y esclavos de satanás fueron hechos hijos de Dios, partícipes de la naturaleza divina, por la gracia de Dios saltando a la vida eterna. Así también recibí yo mi sacerdocio, pasando por las manos del Cardenal Castrillón, cuya gracia él recibió de las manos de sus predecesores, y ellos de los Apóstoles, y los Apóstoles de las manos sagradas de Jesucrísto mismo. Y también nuestra Fraternidad recibió su aprobación como una sociedad de vida apostólica en la Iglesia, eregida gratuitamente por las llaves de San Pedro. Pero en ocasión de esta epístola, quiero decir un poquito más sobre nuestra fundación, ya que las palabras “tradidi quod et accepi,” “enseñé lo que recibí,” me recuerdan al Monseñor Marcel Lefevbre, quien tiene estas palabras sobre su lápida, y de quien nos separamos en 1988. Uno de sus consejeros, P. Josef Bisig, ahora el rector de nuestro seminario en los EE. UU., nos dio conferencias sobre nuestro origen en el seminario. Y de hecho, comenzó a explicar nuestra identidad con la persona del Mons. Lefevbre y su trabajo después del Concilio Vaticano II, tratando de conservar la misa que nunca fue abrogada. Nuestros fundadores recibieron a través de él, además de su formación, un gran amor por la misa, por la fe, y por la Iglesia. Fue también un ejemplo de humildad. Nos explicó el P. Bisig que cuando los sacerdotes y los fieles se reunían con él, y alguien haría brindis en su honor, profesando su gratitud, y su lealdad hasta la muerte, el Arzobispo se levantaría para corregirlos, diciendo que “yo soy solamente un hombre de la Iglesia, puedo errar. Si me equivoco, síguela a Ella y no a mí.” Así reconoció él su flaqueza y falibilidad. Y así nuestros fundadores se sintieron obligados a concordar con este consejo, el momento en que él decidió consagrar obispos contra la voluntad del Santísimo Padre, un hecho que, si no me equivoco, jamás ha sido aprobado en la historia de la Iglesia. A veces algunos santos obispos consagraban obispos sin el permiso del Papa, pero nunca contra su voluntad. Es una cuestión, pues, teológica--de la unidad de la Iglesia--y no sólo canónica, ya que toca a la autoridad suprema que Jesucristo le encargó a San Pedro. Nuestros fundadores, pues, tomaron con mucho dolor una decisión de conciencia al apartarse de la Fraternidad de San Pío X, ya que estaban muy agradecidos por lo que recibieron del Mons. Lefevbre, pero con el único propósito de continuar su obra, de continuar la misa de siempre y la fé de siempre, permaneciendo adentro de la Iglesia de siempre, reconociendo que todo es una gracia que Dios le ha entregado a su Iglesia, la única arca de salvación, que, como dicen las Escrituras, es negra por los pecadores que están en ella, pero hermosa por su santidad intrínseca, que nunca podrá perder, que gaurantiza la conservación de la fe, la tradición y la liturgia hasta el fin del mundo. No lo digo en un espíritu polemico, pero sólo para decir que nuestra decisión de permanecer bajo el Santísimo Padre no fue un acuerdo de compromiso, sino al contrario, una decisión de tratar de conservar la tradición entera, con la única que la garantiza por siempre, nuestra Santa Madre Iglesia. Madre de la divina gracia: ruega por nosotros. Sertillanges, O.P. Foundations of Thomistic Philosophy. John of St. Thomas, O.P. Outlines of Formal Logic. Bittle, O.F.M.Cap. The Science of Correct Thinking: Logic. Munier. A Manual of Philosophy: Cosmology & Philosophical Psychology. Brennan, O.P. Thomistic Psychology: A Philosophic Analysis of the Nature of Man. Oesterle. Ethics: The Introduction to Moral Science. Klubertanz, S.J. Introduction to the Philosophy of Being. H.D. Gardeil, O.P. Initiation à la philosophie de Saint Thomas d'Aquin, vol. 1: Logique. H.D. Gardeil, O.P. Initiation à la philosophie de Saint Thomas d'Aquin, vol. 2: Cosmologie. H.D. Gardeil, O.P. Initiation à la philosophie de Saint Thomas d'Aquin, vol. 3: Psychologie. H.D. Gardeil, O.P. Initiation à la philosophie de Saint Thomas d'Aquin, vol. 4: Métaphysique. Tanquerey. Manual of Dogmatic Theology, vol. 1. Tanquerey. Manual of Dogmatic Theology, vol. 2. Pesch, S.J. Praelectiones dogmaticae, t. 1: Institutiones propedeuticae. Pesch, S.J. Praelectiones dogmaticae, t. 2: De Deo Uno et Trino. Pesch, S.J. Praelectiones dogmaticae, t. 3: De Deo Creante et Fine Ultimo. Pesch, S.J. Praelectiones dogmaticae, t. 4: De Verbo Incarnato; De Sanctis. Pesch, S.J. Praelectiones dogmaticae, t. 5: De gratia; De lege. Pesch, S.J. Praelectiones dogmaticae, t. 6: De Sacramentis I.
Pesch, S.J. Praelectiones dogmaticae, t. 7: De Sacramentis II. Pesch, S.J. Praelectiones dogmaticae, t. 8: De virtutibus theologicis. Pesch, S.J. Praelectiones dogmaticae, t. 9: De virtutibus moralibus; De novissimis. Ryan & Boland. Catholic Principles of Politics. Prummer, O.P. Manuale Juris Canonici. Ramstein, O.F.M.Conv. A Manual of Canon Law. Index of Forbidden Books (1948). Card. Billot, S.J. De immutabilitate Traditionis contra modernam haeresim evolutionismi. Card. Billot, S.J. De Deo Uno et Trino: Commentarius in Primam Partem S. Thomae. Card. Billot, S.J. De personali et originali peccato: Commentarius in Primam Secundae (Qq. 71-89). Card. Billot, S.J. De gratia: Commentarius in Primam Secundae. Card. Billot, S.J. De virtutibus infusis: Commentarius in Secundam Partem S. Thomae: De virtutibus infusis in genere, et theologicis in specie. Card. Billot, S.J. De Verbo Incarnato: Commentarius in Tertiam Partem S. Thomae. Card. Billot, S.J. Tractatus de Ecclesia Christi sive Continuatio theologiae de Verbo Incarnato (Tomus prior: De credibilitate Ecclesiae, et de intima ejus constitutione). Card. Billot, S.J. De Ecclesiae Sacramentis: Commentarius in Tertiam Partem S. Thomae (Tomus prior: De Sacramentis in communi, De Baptismo, De Confirmatione, De Eucharistia). Card. Billot, S.J. De Ecclesiae Sacramentis: Commentarius in Tertiam Partem S. Thomae: (Tomus posterior: De Poenitentia, Extrema Unctione, Ordine, et Matrimonio). Perrone, S.J. Praelectiones dogmaticae, t. 1-2: De vera religione; De locis theologicis. Perrone, S.J. Praelectiones dogmaticae, t. 3-4: De locis theologicis (cont. ); De Deo Uno et Trino. Perrone, S.J. Praelectiones dogmaticae, t. 5-6: De Deo Creatore; De Incarnatione et cultu sancto. Perrone, S.J. Praelectiones dogmaticae, t. 7-9: De gratia et Sacramentis in genere. Bl. Ildelfonso Schuster. The Sacramentary. Solesmes. The Liturgy: Papal Teachings. Oppenheim. Principia theologiae liturgiae (Institutiones VII). Montague. Problems in the Liturgy. Haegy. Manuel de liturgie et cermonial. Sterky. Manuel de liturgie et cermonial. Stehle. Manual of Episcopal Ceremonies. Mueller, S.J. Handbook of Ceremonies. Rev. O’Brien. In Sacristy and Sanctuary. Rev. Kavanagh. The Altar Boy’s Ceremonial. Rev. McManus. The Rites of Holy Week. Zualdi & O’Callaghan, C.M. Sacred Ceremonies of Low Mass. Baumer & Biron. Histoire du Breviaire. O'Connel. The Ceremonies of Holy Week, Solemn Rite and Simple Rite: A Commentary. 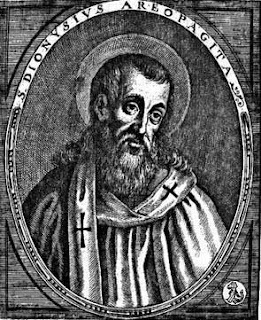 For understanding of the books of blessed Dionysius it ought to be considered that the things which are contained in sacred Scripture regarding God are artificially divided into four parts: now in a certain book, which we do not have titled On the Divine Hypostases and Characteristics, he teaches the things of God which pertain to the unity of the Divine essence and the distinction of the persons. Regarding which unity and distinction sufficient similitude is not found in created things, but this mystery exceeds all faculty of natural reason. What things truly are said of God in the Scriptures, of which kind is every similitude with creatures, have themselves in two ways. Now a similitude of this kind is indeed attained in certain things following something in creatures derived from God. Thus from the first Good are all good things and from the first Life are all living things and thus of the other similitudes. And such things Dionysius goes through in the book On Divine Names which we have before our hands. In the other way, true similitude is attained following something translated from creatures to God. Thus God is called lion, rock, sun or something else of this kind; thus also God is named symbolically or metaphorically. And Dionysius goes through things of this kind in that book which is titled Of Symbolic Theology. But because all similitude of creatures to God is deficient and that which is God exceeds every thing which is found in creatures, whatever is known by us from creatures is removed from God, after the manner which it is in creatures; in whatever way, after everything thing which our intellect taught by creatures is able to conceive of God, that which is God Himself remains dark and unknown. For not only is God not a stone or sun, qualities apprehended by the senses, but neither is he that kind of life or essential quality able to be understood by us and thus what God is Himself, after exceeding all which is apprehended by us, remains unknown to us. Of this kind of remoteness however the ways by which God remains unknown to us and made dark is another book which is titled Regarding the Mystery Which Is Occult Theology. It ought to be considered that blessed Dionysius uses an obscure pen in all his books. This however he did not do from ignorance, but from diligence that the sacred and divine doctrine would remain hidden from the mockery of infidels. Also, difficulties arose (fell) in the afore mentioned books from many causes: first, indeed because he very often uses the pen and mode of speaking which the Platonists use, which is unfamiliar to moderns. For the Platonists, wishing to reduce all composites or material things to simple and abstract principles, posited separate species of things, saying what man is is beyond matter, and likewise for a horse, and thus of the other species of natural things. They said therefore, that this singular sensible man is not the itself the thing which is man, but is called man by participation in that separate man. Thence in this sensible man they discover something which does not pertain to the species of man, namely individual matter and other things of this kind. But in the separate man there is nothing except what pertains to the species of man. Thence they names the separate man man per se, for the reason that it has nothing except what is of humanity; and principal man, insofar as humanity is derived to sensible men from the separate man, through the mode of participation. Thus also it is able to be said that the separate man is above men and that separate man is the humanity of all sensible men, insofar as human nature fully joins to the separate man, and from this is derived in sensible men. Nor only did the Platonists make such abstractions about the ultimate species of natural things, but also about the maximally common things, which are good, one, and being. Indeed, they posited one first which is itself the essence of good and unity and to be, which we call God, and that all others are called good or one or beings through derivation from that first. Thence they called that first good itself, or good in itself, or principal good or supergood, or also good of all goods whether good or essence and substance, according to that mode which has been exposited concerning separate man. Therefore the things of the Platonists are not consonant to the order of faith nor to truth, according to that which they contain regarding the separate natural species, but according to that which they say about the first foundation of things, their opinion is most true and consonant to the Christian faith. Thence Dionysius indeed sometimes calls God good itself or supergood or principal good or good of all good things. And likewise he names Him superlife, supersubstance and deity itself thearchian, which is principle deity, because the name of diety is indeed admitted to certain creatures according to a certain participation. 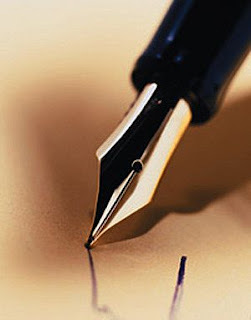 The second difficulty arises in his writings because he often uses effective reasons to prove his point and often expounds them with few words or even with just one word. Third he often uses a certain multiplication of words because, although it may seem superfluous, nevertheless with diligent considerations it is found to contain great profundity of thought. Therefore, in this book, which is called On Divine Names, he first sets forth, after the manner of those who artfully handed down the sciences, what things are necessary for the following consideration; second, in chapter 3, he begins to follow principle intent, which begins et primam etc. Regarding the first, he makes two divisions: in the first, he shown the order of divine names; second, he shows that the names, from which he draws in this book, are common to all the Trinity; and this begins in the second chapter which begins: thearchicam totam essentiam etc. The first of these he further divides in two: first, he continues the preceding book, where writing to blessed Timothy, he says “after the theology of the hypostases”, that is the divine distinctions by which the persons in the Trinity are mutually distinguished, he will go on “to revealing” that is manifesting “the divine names”, according to his power. For it seems to be elevated completely above man. Second, where he says: esto etc. he begins to put forth what is necessary for the following work. Moreover, he sets forth two things: indeed first, the mode of proceeding in this work, for this is necessary to know in advance in any teaching. Second, he shows the order of divine names which he intends to prove in this book; this begins has sequentes etc. And these two are sufficiently shown in the prologue of this chapter which is written thus: quae sermonis intentio, according to the first; and quae de divinis nominibus traditio, regarding the second. Regarding the first division, he says two things: first, he shows from what things ought to be the foundations of this book, because it ought not lean upon human reason, but divine revelation. This fact he learned from the apostle who said in I Corinthians 2 “not with persuasive words of human wisdom (…): but through the teaching of the Spirit, Spiritual things being taught by the Spirit” and this is what he says “Esto autem et nunc nobis eloquiorum lex praedefinita” which would be more easily rendered “Sit autem etiam nunc lex eloquiorum praedeterminata a nobis” and in English: “Now the law of speaking (by which law he means the things handed down in holy Scripture) ought to be fixed before hand by us” just as it once was by the apostle; and that law is this: “ veritatem nos asserverare dictorum de Deo, non in persuasibilibus humanae sapientiae verbis, sed in demonstratione virtutis theologorum motae a spiritu” which is more easily rendered as “nos astruere” or “nos manifestare veritatem dictorum de deo, non in persuasibilibus humanae sapientiae verbis, sed in demonstratione virtutis theologorum motae a spiritu” which in English is “that we strive to write true things of God, not with persuasive words of human wisdom,” that is not leaning upon the medial first principles of human reason which proceed to the proposition to be shown according to natural reason, but “in explanation of the virtue of the theologians” that is of those who wrote sacred scripture, the Apostles and Prophets, “of virtues” I say, “moved by the spirit”, that is the Holy Spirit. For in his doctrine Dionysius is supported by the authority of sacred Scripture, which authority has strength and efficacy because the Apostles and Prophets are moved to speaking by the Holy Spirit revealing to them and speaking through them. For we are joined to the higher through faith than the things to which the natural reason pertains, and we cling more surely, inasmuch as the divine revelation is surer than human cognition. 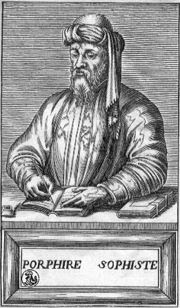 He says therefore “rationalis et intellectualis” “Reasoning and intellection” because of the things which we naturally know, certain things are known in themselves by us, without any investigation, and properly regarding is intellection; other things are truly known through inquisition and of these is reasoning. He says however “operationis et vertutis” “operation and power” because we understand many things through power (of the soul), which we do not seek out through action. Then, when he says “igitur universaliter etc.” “therefore universally etc.” he shows what things ought to be taught in this doctrine; and first, he puts forth the proposition; second, he manifests the same; where he says “nam supersubstantialem scientiam etc.” “now the supersubstantial science etc.” He concludes this proposition however from premises. For in this and in human sciences it is believed, that principles and conclusions are from the same origin. Thus therefore the principles from which this doctrine proceeds are things which are received through the revelation of the Holy Spirit, and are contained in holy Scripture: this is therefore what he concludes, that someone ought to dare “dicere, nec etiam cogitare aliquid de occulta deitate supersubstantiali “to speak” that is with the mouth “now also to think something about the hidden supersubstantial divine nature” which is over all substances and because of this is hidden to us for whom creaturly substances are proportionate for cognition, and through argumentation for speaking, “except things which have been divinely squeezed forth from us from the holy writings” (“praeter ea quae nobis divinitus ex sanctis eloquiis sunt expressa ... exprimuntur per sancta eloquia”. However he does not say they are signified “in holy writings”, but “from holy writings” because whatever things from these things which are contained in sacred Scripture are able to be called out, they do not belong to another thing from that doctrine (from which they are drawn out tr. ), for such things that are not contained in sacred Scripture are allowed. Then, when he says “nam supersubstantialem scientiam etc.” “now the supersubstantial knowledge…” he introduces the reason for manifesting the proposition; first he states the reason; second, he demonstrates a certain thing which he puts under the proposition, at “etenim etc.” “for indeed…” The virtue of his reason is as follows: regarding something which is known by one alone, no one is able to cognize or speak it, unless inasmuch as it is manifested by that one. However, it is proper to God alone to perfectly cognize himself according to what he is. Therefore none is able to truly speak about God or to cognize him unless inasmuch as he is revealed by God. Indeed such a divine revelation is contained in sacred Scripture. And this is what he says “convenit ipsi attribuere supersubstantialem scientiam ignorantiae supersubstantialitatis quae est super rationem et intellectum ipsam substantiam” “It is fitting to ascribe to himself” that is to God alone “knowledge of the ignorant supersubstance” that is of the unknown divine supersubstance “which”—for indeed supersubstantiality is not unknown because of some defect, but because of its excess, because namely “it is beyond the reason and the intellect” which is created and over the created “substance itself” which is an object and commensurate to the created intellect, likewise the uncreated essence is proportional to uncreated knowledge. Therefore just as the divine essence is supersubstantial, likewise knowledge of it is called supersubstantial. For it is always proper that an object of the cognitive power be proportional to the power of knowing. 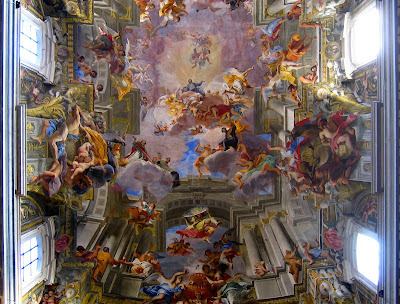 Nevertheless that he not be flattened out in ignorance of the nature of God, he adds: “how great a radius of the thearchian eloquence extends itself to extend us who are reflecting on” through spiritual contemplation “the higher thing” that is on that which is above us, namely God, “to higher splendors” that is to intelligible truths of divine things. For the truth of Sacred Scriptures is a certain light like a radius derived from first truth which light does not extend itself to the point that like angels and the blessed seeing his essence, we should through Himself be able to see the essence of God or to cognize all which God in Himself knows, but fully, to a certain termination or measure, truths of divine things are manifested by the light of sacred Scripture. 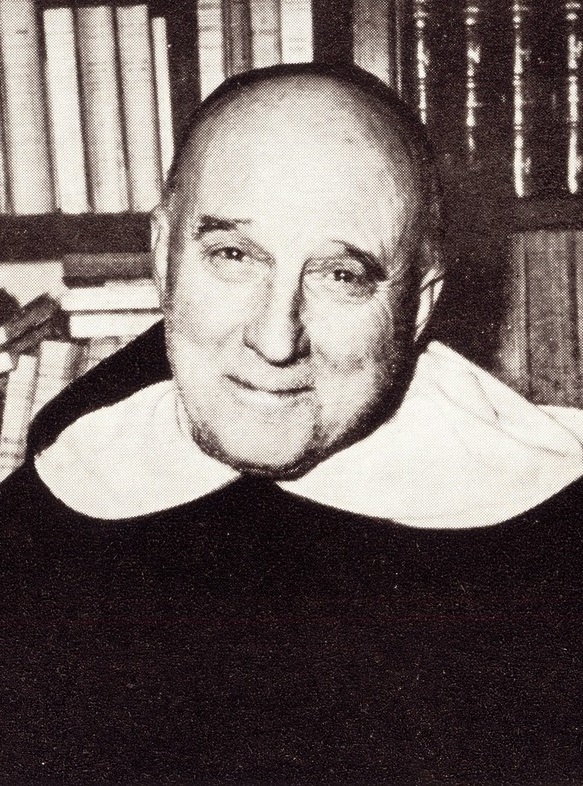 “And” thus, now we do not extend ourselves more to understanding divine things, than the light of sacred Scripture extends itself, “snub-nosed” through this “constriction”, as if confined to a certain limit “about divine things” by a kind of “temperance and sanctity”: by sanctity when we maintain the splendid truth of sacred Scripture from all error; by temperance when we thrust ourselves to things no greater than we have been given. Then, when he says “etenim” “for indeed” etc. he shows clearly what the reason for this conclusion are: and first, that God is known to Himself alone, too us however he is hidden; second, he shows clearly the way by which the divine cognition is communicated to us; where: “non tamen incommunicabile est” “it is not however incommunicable” etc. Regarding the first, he shows twice; the first of these, from reasons, second from authorities; where “etenim sicut ipsa de seipsa” “for indeed just as himself from he himself…” He puts however, at the first, two reasons; of which the first thus: divine things are revealed by God according to the proportion of the things to whom they are revealed; but to know the infinite is beyond the proportion of the finite intellect; therefore the thing itself which God is beyond the proportion of the finite intellect; therefore the thing itself which God is not known by anyone through divine revelation. And this is what he says: certain “divine things are revealed” by God “and contemplated” by us, “according to the proportion of the minds of each.” [It would seem mentuim “of minds” should be singular, but it is plural here, and in Dionysius…] And I have amended what he earlier said [because it was too difficult] to: “If it is fitting in any respect to believe the all wise and most true theology”, that is sacred Scripture [divine things are revealed according to the minds of each]. Fir it says in Matthew 25 “he gave …to every man according to his several ability.” (AV) And it should be noted that he lays down two reasons from which it is shown that sacred Scripture ought to be believed in the highest degree. [It doesn’t match!!!!] For it happens to something that it is not to be believed from two reasons: either because it is, or at least is reputed to be, ignorant, or because it is, or at least is reputed to be, malicious. Thence, as sacred Scripture is all-wise, and most true because it has been revealed by and related by God who is truth and knows all, sacred Scripture ought to be believed in the highest degree. And this I say “thearchic” that is divine “goodness” having been separated “from the measured things” that is, from finite things, by “immesurability” that is by the infinitude of the divine essence, but not with the result that we are not acquainted with it in any way, but that it is not comprehended. In this he touched upon four things, namely: substances, which are the object of cognition; mind, that is simple intellect; deliberation, that is investigative reason and which pertains to cognitive virtues; and the word which pertains to the manifestation of cognition. He gives however these four because he does not only intend to show that God is not able to be comprehended through any cognitive virtue, or to be manifested perfectly in speech, but neither is he [comprehended or manifested] through any created object or through any creaturely similitude. Thus also in the examples which he gives, he does not say that intelligible things are incomprehensible to the senses, but to sensible things because intelligible things are not able to be comprehended through sensible. And likewise for the other examples. And it should be noted that he does not only say that intelligible things are incomprehensible through sensible things, but also uncontemplible because through things which are of an inferior order, not only are superior things not able to be comprehended, but neither are they contemplated. This is because we contemplate through something when through one thing we are able to see the essence of that we may know from what it is. The essence of something is comprehended however when it is held in cognition [cognoscit] perfectly, as it is knowable [cognoscibilis]. For who knows the demonstrated conclusion to a medial degree, even if he somehow contemplates it, nevertheless, he does not comprehend it because he does not reach up to the perfect mode of his cognition. Thus, therefore, God is indeed incomprehensible to all created intellects because he is beyond all mind and reason, inasmuch as having more from the brightness of truth in his essence (and this pertains to knowability), than any creature from his power of knowing. Thus no creature is able to attain to the perfect mode of his own knowledge, which is called “supersubstantial knowledge” which would be to comprehend him. Nevertheless, the created intellect is able to contemplate his essence according to some mode which shall be attained, but not through any abject of species or any creaturly similitude, because none of them is able to lead [?] into the divine essence much less than the body is able to lead into incorporeal essence. Thus therefore, according to the reasoning of Dionysius it is fitting to say that God is both incomprehensible to all intellects and incontemplatible to us in his essence, in that our intellect has been bound to created things, namely to things which are of similar nature to us; and thus it is in the state of life. And because he had called God unity, lest anyone believe it is that unity inhering in things formally, just as in things themselves by participation, in order that this be excluded he adds “unity” namely subsisting in itself, “unifying all unity” that is pouring out unity into all things which participate in unity according to any mode. Then because God had been called supersubstantial unity and good beyond the mind, someone is able to believe that God is in no way able to be called a substance or mind or anything of this kind, therefore, to exclude this error, he adds that God is indeed “a substance” but “supersubstantial.” Concerning this odd language we ought to reflect that names, when they have been imposed by us, they signify according to how things stand in our cognition. Therefore that itself which God is is beyond our cognotion, as has been made clear, our cognition however is commensurable to created things, the names we have imposed thus do not signify according to a congruence to the divine excellence, but according to a coming together to the essence of created things. The “to be” of created things however, has drawn out from the divine “to be” according to a certain sort of incomplete assimilation. Thus therefore, because of this, whatever similitude there is of created things to God, the names which we use are able to be said to be names of God—not as they would be of creatures, but through a certain projection—and Dionysius signifies this when he says that God is “a supersubstantial substance” (supersubstantialis substantia), and he puts it similarly that God is “a non intelligible intellect” (intellectus non-intelligibilis), that is not the sort of intellect which is intelligible [I’m not sure what the technical translation of this word is, it means able to be held in our intellect MNP] “and” he is “an unspeakable word” (verbum non-dicibile), that is not the sort of word which is able to be spoken by us. However, just as the names which we impose are able to be said of God following the fact that there is some similitude of creatures to God; likewise following the fact that creatures fall short from a full image of God, the names we impose are able to be removed from God, and their opposite to be predicated (of Him). Whence he adds that God thus is called “reason” which is also able to be called “irrationality” (irrationabilitas), and thus he is called an intellect that is able to be called “non-intellectuality” (non-intelligibilitas); and thus he is called a word that is able to be called “non-namedness” (innominabilitas); not indeed because of this that these things do not extend to Him, but because “like (?) (secundum) none of the existing things is (his) existence”, that is he does not exist according to (secundum) the manner of any existing thing; “and” He Himself, “indeed” is “the cause” of existing “for all”, pouring forth into all whatsoever (?) their similitude; and thus he is able to be named from the names of creatures; “He Himself however is non-existing” not as if lacking an essence, but “as it were” existing “above all substances”; and he is “non-namedness” (innominabilitas) “thus he utters Himself from Himself, Personally and Knowingly” that is according to the property of his own “to be” and according to His own perfect Knowledge of Himself, by which mode, no one is able to utter Him. After these things have been said, he reaches the first conclusion when he adds: “from this therefore, just as it has been said, one ought not dare to speak nor to know anything about the supersubstantial and hidden deity, save those things which have been Divinely expressed to us from the Holy Speech” which has been explained above. It is impossible for any created good to constitute man's happiness. For happiness is the perfect good, which lulls the appetite altogether; else it would not be the last end, if something yet remained to be desired. Now the object of the will, i.e. of man's appetite, is the universal good; just as the object of the intellect is the universal true. Hence it is evident that naught can lull man's will, save the universal good. This is to be found, not in any creature, but in God alone; because every creature has goodness by participation. Wherefore God alone can satisfy the will of man, according to the words of Psalm 102:5: "Who satisfieth thy desire with good things." Therefore God alone constitutes man's happiness. Respondeo dicendum quod impossibile est beatitudinem hominis esse in aliquo bono creato. Beatitudo enim est bonum perfectum, quod totaliter quietat appetitum, alioquin non esset ultimus finis, si adhuc restaret aliquid appetendum. Obiectum autem voluntatis, quae est appetitus humanus, est universale bonum; sicut obiectum intellectus est universale verum. Ex quo patet quod nihil potest quietare voluntatem hominis, nisi bonum universale. Quod non invenitur in aliquo creato, sed solum in Deo, quia omnis creatura habet bonitatem participatam. Unde solus Deus voluntatem hominis implere potest; secundum quod dicitur in Psalmo CII, qui replet in bonis desiderium tuum. In solo igitur Deo beatitudo hominis consistit. Let us consider (1) the fact which is the starting-point of the proof, (2) the principle on which the proof rests, (3) the culminating point of the proof, and (4) what the proof cannot extend to. We can ascend to the sovereign good, the source of perfect and unalloyed happiness, by starting either from the notion of imperfect subordinate goods or from the natural desire which such goods never succeed in satisfying. If we begin with those finite limited goods which man is naturally inclined to desire, we very soon realize their imperfection. Whether it be health or the pleasures of the body, riches or honors, glory or power, or a knowledge of the sciences, we are forced to acknowledge that these are but transitory goods, extremely limited and imperfect. But, as we have said repeatedly, the imperfect, or the good mingled with imperfection, is no more than a good participated in by the restricted capacity of the recipient, and it presupposes the pure good completely excluding its contrary. Thus a wisdom associated with ignorance and error is no more than a participated wisdom, presupposing wisdom itself. This is the metaphysical aspect of the argument, the dialectic of the intellect proceeding by way of both exemplary and efficient causality. It is impossible for man to find in any limited good that true happiness which by his very nature he desires, for his intellect, becoming immediately aware of the limitation, conceives forthwith the idea of a higher good, and the will naturally desires it. This fact is expressed in the profound sentence of St. Augustine's Confessions (Bk. I, chap. 1): "Our heart, O Lord, is restless, until it finds its rest in Thee" (irrequietum est cor nostrum donec requiescat in Te, Domine). Who of us has not experienced this fact in his intimate life? In sickness we have the natural desire to recover our health as a great good. But, however happy we are in our recovery, no sooner are we cured than we realize that health alone cannot bring happiness: a man may be in perfect health and yet be overwhelmed with sadness. It is the same with the pleasures of the senses: far from being sufficient to give us happiness, let them be abused ever so little and they bring only disillusion and disgust; for our intellect, with its conception of a universal unlimited good, straightway tells us: "Now that you have obtained this sensible enjoyment which just now had such an attraction for you, you see that it is sheer emptiness incapable of filling the deep void in your heart, of satisfying your desire for happiness." It is the same with wealth and honors, which many desire eagerly. We no sooner possess them than we realize how ephemeral and superficial is the satisfaction they give, how inadequate they, too, are to fill the void in our hearts. And intellect tells us that all these riches and honors are still but a poor finite good that is dissipated by a breath of wind. The same must be said of power and glory. One who is lifted up on the wheel of fortune has scarcely reached the top when he begins to descend; he must give place to others, and soon he will be as a star whose light is extinguished. Even if the more fortunate retain their power and glory for a time, they never find real happiness in it; often they experience such anxiety and weariness of mind that they long to withdraw from it all. The same applies to the knowledge of the sciences. Here it is a case of only an extremely limited good; for the true, even when complete and without admixture of error, is still the good of the intellect, not of man as a whole. Besides the intellect, the heart and will have also their profound spiritual needs, and so long as these remain unsatisfied there can be no true happiness. Shall we find it in a most pure and exalted form of friend ship? Such a friendship will doubtless bring us intense joy, sometimes affecting our inmost being. But we have an intellect that conceives universal and unlimited good, and here again it will not be long in perceiving that this most pure and exalted form of friendship is still but a finite good. This reminds us of those words of St. Catherine of Siena: "Would you continue long to slake your thirst with the cup of true friendship? Leave it, then, beneath the fountain of living water; otherwise it will speedily be drained and no longer satisfy your thirst." If the thirst is satisfied, it is because the person loved is made better, and in order to be made better he needs to receive a new goodness from a higher source. Suppose we could look upon an angel and see his suprasensible, purely spiritual beauty. Once. the first sense of wondering amazement had passed, our intellect, with its conception of the universal, unlimited good, would immediately remind us that even this was no more than a finite good and thereby exceedingly poor in comparison with the unlimited and perfect good itself. Two finite goods, however unequal they may be, are equally remote from the infinite; in this respect the angel is as insignificant as the grain of sand. Can it be that this natural desire for happiness, which we all have within us, must forever remain unsatisfied? Is it possible for a natural desire to be of no effect, chimerical, without meaning or purpose? That a desire born of a fantasy of the imagination or of an error of reason, such as the desire to have wings, may be chimerical, can well be understood. But surely it could not be so with a desire which has its immediate foundation in nature without the intervention of any conditional judgment. The desire for happiness is not a mere hypothetical wish; it is innate, with its immediate foundation in nature itself; and nature again is stable and constant, being found in all men, in all places, and at all times. Furthermore, this desire is of the very nature of the will, which, prior to any act, is an appetitive faculty having universal good as its object. The nature of our will can no more be the result of chance, of a fortuitous encounter, than can the nature of our intellect; because, like the intellect, the will is a principle of operation wholly simple, in no way compounded of different elements that chance might have brought together. Can this natural desire of the will be chimerical? In answer to this question we say, first, that natural desire in beings inferior to ourselves is not ineffectual, as the naturalists have shown from the experimental point of view. In herbiverous animals the natural desire is for herbaceous food, and this they find; in carnivores the desire is to find flesh to eat, and they find it. Man's natural desire is for happiness, and with him true happiness is not and cannot be found in any limited good. Is this true happiness nowhere to be found? Is man's natural desire, then, to remain a deception and without finality when the natural desire of inferior beings is not in vain? And this is not purely a naturalist's argument based on experience and the analogy of our own natural desire with that of inferior beings. It is a metaphysical argument based on the certitude of the absolute validity of the principle of finality. If the natural desire for true happiness is chimerical, then all human activity, inspired as it is by that desire, is without finality, without a raison d'être, and thus contrary to the necessary and evident principle that every agent acts for an end. To grasp the truth of this principle, thus formulated by Aristotle, it is enough to understand the terms of the proposition. Any agent whatsoever, conscious or unconscious, has an inclination to something determinate which is appropriate to it. Now the end is precisely that determinate good to which the act of the agent or the motion of the mobile object is directed. This principle, self-evident to one who understands the meaning of the words agent and end, may be further demonstrated by a reductio ad absurdum; for otherwise, says St. Thomas (Ia IIae, q. 1, a. 2), "there would be no reason why the agent should act rather than not act, no reason why it should act in this way rather than in another, " why it should desire this object rather than some other. If there were no finality in nature, if no natural agent acted for some end, there would be no reason why the eye should see and not hear or taste, no reason why the wings of the bird should be for flying and not for walking or swimming, no reason for the intellect to know rather than desire. Everything would then be for no purpose, and be unintelligible. There would be no reason why the stone should fall instead of rising, no reason why bodies should attract rather than repel one another and be dispersed, thus destroying the harmony of the universe. The principle of finality has an absolute necessity and value. It is no less certain than the principle of efficient causality, that everything that happens and every contingent being demands an efficient cause, and that in the last analysis everything that happens demands an efficient cause itself uncaused, a cause that is its own activity, its own action, and is therefore its existence, since action follows being and the mode of action the mode of being. These two principles of efficient and final causality are equally certain, the certitude being metaphysical and not merely physical, antecedent to a demonstration of the existence of God. Indeed, without finality, efficient causality is inconceivable: as we have just seen, it would be without a purpose and consequently unintelligible. There is, then, a purpose in our natural desire for happiness; its Inclination is for some good. But is this inclination for a good that is wholly unreal, or, though real, yet unattainable? In the first place, the good to which our natural desire tends is not simply an idea in the mind, for, as Aristotle more than once pointed out, whereas truth is formally in the mind enunciating a judgment, the good is formally in things. When we desire food, it is not enough for us to have the idea: it is not the idea of bread that nourishes, but the bread itself. Hence the natural desire of the will, founded as it is in the very nature of the intellect and the will and not merely in the imagination or the vagaries of reason, tends to a real good, not merely to the idea of the good; otherwise it is no longer a desire and certainly not a natural one. It will perhaps be said that our universal idea of good leads us to seek happiness in the simultaneous or successive enjoyment of all those finite goods that have an attraction for us, such as health and bodily pleasures, riches and honors, the delight in scientific knowledge, art and friendship. Those who in their mad career wish to enjoy every finite good, one after another, if not all at once, seem for the moment to think that herein lies true happiness. But experience and reason undeceive us. That empty void in the heart always remains, making itself felt in weariness of spirit; and intelligence tells us that not even the simultaneous possession of all these goods, finite and imperfect as they are, can constitute the good itself which is conceived and desired by us, any more than an innumerable multitude of idiots can equal a man of genius. Quantity has nothing to say in the matter; it is quality of good that counts here. Even if the whole sum of created goods were multiplied to infinity they would not constitute that pure and perfect good which the intellect conceives and the will desires. Here is the profound reason for that weariness of spirit which the worldly experience and which they take with them wherever they go. They pursue one thing after another, yet never find any real satisfaction or true happiness. Now if our intellect is able to conceive a universal, unlimited good, the will also, awakened as it is by the intellect, has a range and depth that is limitless. Is it possible, therefore, for its natural desire—which calls for a real good and not merely the idea of good—to be chimerical and of no effect? This natural desire, which has its foundation not in the imagination but in our very nature, is, like that nature, something fixed and unchangeable. It can no more be ineffectual than the desire of the herbivora or that of the carnivora; it can no more be ineffective than is the natural ordering of the eye for seeing, the ear for hearing, the intellect for knowing. If therefore this natural desire for happiness cannot be ineffective, if it cannot find its satisfaction in any finite goods or in the sum total of them, we are necessarily compelled to affirm the existence of a pure and perfect good. That is, the good itself or the sovereign good, which alone is capable of responding to our aspirations. Otherwise the universal range of our will would be a psychological absurdity, something radically unintelligible and without a purpose. Does it follow that this natural desire for happiness in us demands that we attain to the intuitive vision of God, the sovereign good? By no means; for the intuitive vision of the divine essence is essentially supernatural and therefore gratuitous, in no way due to our nature or to the nature of angels. This is the meaning of St. Paul's words: "Eye hath not seen, nor ear heard; neither hath it entered into the heart of man, what things God hath prepared for them that love Him. But to us God hath revealed them by His Spirit. For the Spirit searcheth all things, yea, the deep things of God" (I Cor. 2: 9). But far inferior to the intuitive vision of the divine essence and to Christian faith, is a natural knowledge of God as the author of nature, which is the knowledge given us by the proofs of His existence. If original sin had not enfeebled our moral strength, this natural knowledge would have enabled us to attain to a naturally efficacious love for God as the author of nature, who is the sovereign good known in a natural way. But gratuitously we have received far more than this: we have received grace which is the seed of glory, and with it t supernatural faith and a supernatural love for God, who is no longer the author merely of nature but also of grace. And so, for us Christians, the proof we have been discussing receives strong confirmation in the happiness and peace to be found even here on earth through union with God. In a realm far beyond any glimpse that philosophical reason might obtain, though not yet the attainment of the perfect beatitude of heaven, true happiness is ours to the extent that we love the sovereign good with a sincere, efficacious, generous love, and above all things, more than ourselves or any creature, and to the extent that we direct our whole life daily more and more to Him. In spite of the occasional overwhelming sorrows of this present life, we shall have found true happiness and peace, at least in the summit of the soul, if we love God above all things; for peace is the tranquillity that comes with order, and here we are united to the very principle of all order and of all life. Our proof thus receives strong confirmation from the profound experiences of the spiritual life, in which are realized the words of our Lord: "Peace I leave with you: My peace I give unto you: not as the world giveth, do I give unto you" (John 14:27). It is not in the accumulation of pleasures, riches, honors, glory, and power, but in union with God, that the Savior has given us peace. So solid and enduring is the peace He has given us that He can and actually does preserve it within us, as He predicted that He would, even in the midst of persecutions: "Blessed are the poor.... Blessed are they that hunger and thirst after justice.... Blessed are they that suffer persecution for justice' sake, for theirs is the kingdom of heaven" (Matt. 5: 10). Already the kingdom of heaven is theirs in the sense that in union with God they possess through charity the beginnings of eternal life, inchoatio vitae aeternae (IIa IIae, q. 24, a. 3 ad 2um). Epicurus boasted that his teaching would bring happiness to his disciples even in the red-hot brazen bull of Phalaris in which men were roasted to death. Jesus alone has been able to accomplish such a thing by giving to the martyrs in the very midst of their torments peace and true happiness through union with God. According to the degree of this union with God, the proof we have been discussing is thereby very much confirmed by reason of the profound spiritual experience; for, through the gift of wisdom, God makes Himself felt within us as the life of our life: "For the Spirit Himself giveth testimony to our spirit that we are the sons of God" (Rom. 8: 16). God makes Himself felt within us as the principle of that filial love for Him which He Himself inspires in us. 6. Cf. Summa Theologica, Ia IIae, q. 2, a. 8. 7. Cf. ibid., Ia IIae, q. 1, a. 4: "Is there an ultimate end to human life?" "Absolutely speaking, it is impossible in a series to continue to infinity in any direction.... Were there not an ultimate end, nothing would be desired, no action would have a term, nor would the inclination of the agent find repose. 8. If, instead of considering simply the end of this natural desire, we consider its ordering to that end—and this demands an efficient, regulating cause (ordinans vel imperans movet ut agens, non ut finis)—then the argument pertains to the fifth way of St. Thomas, which is that based upon the presence of order in the world: "All design presupposes a designer." In this sense the passive ordering of our will to the bonum honestum or moral good, superior alike to the delectable and to the useful, presupposes a supreme regulator. Or again, moral obligation, which is displayed in remorse of conscience and in the peace that comes from duty accomplished, presupposes a supreme lawgiver. Of this we will speak in the next chapter. 9. Cf. Cajetan, Commentary on Ia IIae, q. 2, a. 7.